Wilmington, N.C. - There’s always a lot of buzz about the Cucalorus Film Festival, a truly unique annual event that exemplifies Wilmington, North Carolina’s creative and independent spirit. With more than 260 film screenings and events, it can be a bit overwhelming to get one’s head wrapped around—even for seasoned film enthusiasts. Following are 10 things to note about Cucalorus 22 (Nov. 9-13, 2016), with tips designed to help attendees make the most of this year’s festival. What is the Cucalorus Film Festival? The short answer is that it’s an independent film festival in Wilmington, North Carolina that MovieMaker magazine has proclaimed one of the “coolest film festivals in the world” (2015). The magazine also regularly includes Cucalorus in its roundup of “50 film festivals worth the entry fee.” The Cucalorus Film Festival’s unusual name was inspired by a piece of lighting equipment (referred to as a ‘cucalorus’) that creates a dappled lighting effect, as demonstrated by the festival’s logo. For details on the Cucalorus Film Festival, visit www.cucalorus.org. What makes Cucalorus and Wilmington so “cool”? The Cucalorus Film Festival is a favorite with filmmakers and audiences because it never disappoints by delivering a diverse mix of documentary and narrative feature films, shorts, dance and music videos, alongside signature events. In the world of film festivals, Cucalorus stands out. It was established in 1994 as a multi-disciplinary arts organization to support emerging and innovative creative professionals. It has since grown into one of the largest film festivals in the South, with more than 250 films that screen each year at downtown venues in Wilmington, North Carolina, which Jetsetter.com included in its 2016 roundup of “America&apos;s Coolest Southern Towns,” citing the idyllic riverside hamlet’s Dawson’s Creek settings, coffeehouses, locally sourced restaurants and nearby beaches. Celebrating 22 years, the laid-back, non-competitive Cucalorus Film Festival returns to Wilmington, North Carolina on November 9-13 to celebrate the art of filmmaking with a full five-day schedule of independent film screenings and events, with programs that focus on dance, music videos, emerging artists, social justice. Over the past two-plus decades, the fiercely independent film festival has grown and evolved to keep pace with an ever-changing industry, so there is always something new to experience. What kinds of films and events are slated for this year’s festival? Cucalorus 22 offers 260-plus films (chosen from 1,923 entries) from over 70 countries. This year’s festival includes 41 narrative features; 23 documentary features; 162 shorts; 37 music videos and 5 works-in-progress. And that’s not all! The schedule includes multi-disciplinary performances ranging from dance to spoken word and beyond. For instance, the ever-popular Dance-a-lorus (on Wednesday night) is a communion of dance and film by local dancers and choreographers and indie filmmakers. Other signature multi-media programs include Works-in-Progress (filmmaker lab), Visual/Sound/Walls (a multi-sensory exhibition of music videos) and the Virtual Reality Lounge (mind-bending works). Also returning to Cucalorus 22 is the 10 x10 Filmmaker Challenge whereby 10 entrepreneurs and 10 filmmakers are introduced and paired to collaborate on a short film for Sunday’s closing event. Following a successful inaugural year in 2015, the Cucalorus CONNECT conference returns to celebrate technology and opportunity with more than 40 events that address topics that extend beyond filmmaking to celebrate innovation, venture capital, and entrepreneurship across many industries. For more information about Cucalorus CONNECT, visit www.cucalorus.org/connect/. What’s New for the 2016 festival? Cucalorus Comedy at the Dead Crow Comedy Club features headliner Annie Lederman, who has appeared in Girl Code, Chelsea Lately, Comedy Central&apos;s @midnight, and is the voice of "Cheryl" in Grand Theft Auto V. Performances also feature touring comedians and Cucalorus host, Kevin Yee. Details: http://deadcrowcomedy.com. Attendees are invited to study the schedule and read about the films in order to match the content to primary interests. Festival organizers suggest trying a film or two from this year’s Magnolia program for award-winning and noteworthy selections that have won awards at SXSW and Sundance film festivals such as Tim Sutton’s Dark Night, Ingrid Jungermann’s Women Who Kill, and Keith Maitland’s TOWER. Comedies to look out for in this program include Creedmoria and Diani & Devine meet the Apocalypse. The Vanguard program promises bold new films by emerging directors and visionary artists, many of whom are women. UNC School of the Arts grad Celia Rowlson-Hall&apos;s feature film, Ma, is a sublime retelling of the Virgin Mary myth. Other festival selections produced and directed by women include new features like Sarah Aldina Smith’s Buster’s Mal Heart, Amber Sealey’s No Light No Land Anywhere, and Sophia Takal’s Always Shine. The 20 documentary features rocking the line-up include Carrie Schrader’s The Founders (about the women who started the LPGA), Hilary Linder’s Indivisible, Cynthia Wade and Cheryl Miller Houser’s Generation Startup, and Maya Zinshtein’s U.S. debut Forever Pure. The Voices program showcases politically challenging docs covering a range of issues. And every attendee should check out at least one Shorts Block. Each block has a theme and you&apos;ll see six or seven films for a single ticket. Breaking the traditional festival model, Cucalorus shakes things up with special programming like Dance-a-lorus, Visual/Sound/Walls (music video party), the Bus to Lumberton (David Lynch installation), Cuctails (cocktail workshops), and an extensive Virtual Reality lineup. Guest filmmakers will share insights during Q&A sessions at select events. For a complete schedule, visit www.cucalorus.org/calendar.asp. First-time festival-goers may also wish to check out the “How To” tips offered by Cucalorus Executive Director Dan Brawley in this blog: www.wilmingtonandbeaches.com/news-articles/blogs/cucalorus-film-festival-director-offers-how-to-tips-for-the-first-time-fest/. Are any films by local filmmakers? Each year Cucalorus pays tribute to its North Carolina roots by screening at least 25% of films with connections to its home state. The Cucalorus website offers a feature whereby you can search films by category, program, thread and keywords. Attendees interested in films with N.C. connections should search the keywords “North Carolina.” There’s also a special Saturday program “Joe Dunton: The Big Picture Past and Present” dedicated to Joe Dunton, a legendary camera engineer who has been influential in N.C. film over the past 40 years. He is also credited with cultivating Wilmington’s indie film scene, all the while working with big names like Carol Reed, Stanley Kubrick, George Lucas and David Lynch, among others. Joe&apos;s legacy will also be celebrated with special screenings of Oliver!, The Shining and Dance Craze. For descriptions and details about films, please visit www.cucalorus.org/filmlist.asp. The central ticket box office is located at Thalian Hall Center for Performing Arts, located at 310 Chestnut Street in Wilmington’s river district. Screenings and events will take place at the following Downtown Wilmington venues: Thalian Hall (310 Chestnut St.); CFCC Union Station (502 N. Front St.); Jengo’s Playhouse (815 Princess St.); Ironclad Brewery (115 N. 2nd St.), Throne Theater (208 Market St.); Hell’s Kitchen (118 Princess St.), Expo 216 (216 N. Front St.), Bourgie Nights (127 Princess St.) and Blind Elephant (21 N. Front St.). How do I buy festival passes? Buying your tickets/pass in advance and arriving at screenings at least 30 minutes early will help ensure you get to see your preferred films. For tickets, passes, schedules, film descriptions, venue directions and other details, please visit www.cucalorus.org. You can also pick up a festival schedule at screening venues. How do I find out more about Wilmington’s “Hollywood East” connections? City + Beaches: See where the water takes you and discover why Wilmington and its island beaches are popular with visitors and filmmakers. The Cucalorus Film Festival is held annually in November in Wilmington’s river district, which is located just minutes away from three colorful island beaches. 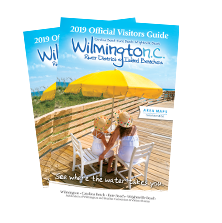 For information on lodging and things to see and do, request a Free Official 2016 Visitors Guide for Wilmington, N.C.’s river district and the beach communities of Carolina Beach, Kure Beach, and Wrightsville Beach: 1-866-266-9690 or visit@wilmingtonandbeaches.com. For seasonal specials and featured events, visit www.wilmingtonandbeaches.com/season/2016-fall-highlights.